Not all decision frameworks underpin environmental justice in the same way. In this methodological report, we invite policymakers and activists to apply an alternative decision making approach – beyond the classical Cost/Benefit Analyses (CBA). A range of Multi Criteria Evaluations (MCEs) have been developed to support social deliberation and social decision-making – all designed to tackle complex problems. Through their participation and deliberation characteristics, certain MCEs provide space for a learning process that will enhance public legitimacy of decisions while keeping the door open to other languages of valuation. 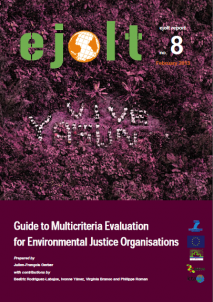 In Guide to Multicriteria Evaluation for Environmental Justice Organisations, we explain the three MCE methods most relevant for organisations working on environmental justice: Social Multicriteria Evaluation (SMCE), Multicriteria Mapping (MCM), and the Integraal framework. Only one aims at calculating a ranking of the different options: the SMCE. The other can end up with a ranking or not, depending on how the process evolves. The report concludes with an example: the ‘leave the oil in the soil’ campaign in Ecuador and Nigeria. An SMEC has been applied to the case of ‘Yasunisation’ – an innovative policy proposal to keep oil in the soil in a particular place in Ecuador that now is suggested for other parts of the world. (More on Yasuni is here and here). This report takes a better look at the implementation of an MCE in a particular case study and offers ‘lessons learned’ for other MCEs in the future. Finally: EJOLT also created a set of policy recommendations for environmental-justice oriented assessments based on this report.